Kids2College brings early college awareness and a college-going culture to your community. The Sallie Mae Fund provides the national curriculum and training free of charge to schools and community groups. Your school or group can bring the Kids2College program to your students. Sign up now to receive more information and free training, materials and support. To learn more, download our Fact Sheet and Curriculum Outline. You can administer the pre- and post- program surveys using either the online survey tool or the machine readable paper surveys. 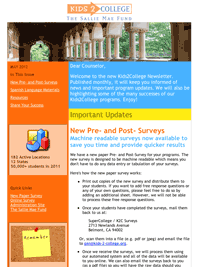 Please select the survey format that works best for your program.